The TLG® Canon of Authors and Works is a searchable database and a bibliographic guide to the authors and works included in the TLG® Digital Library. It provides biographical information about each author (i.e. date by century and epithets that identify the place of birth or literary activity and the genre each author is associated with). Each author is identified by a four-digit number; each work is identified by a three-digit number. For example, Homer is author 0012. Homer's Iliad is identified as 0012.001. The structure of each text is further identified by its particular citation. To use the same example, Homer's Iliad is cited as book/line (0012.001.1.1). The TLG® Canon is a well-established standard used by all digital projects across the globe. It represents many years of research conducted by TLG® staff members. 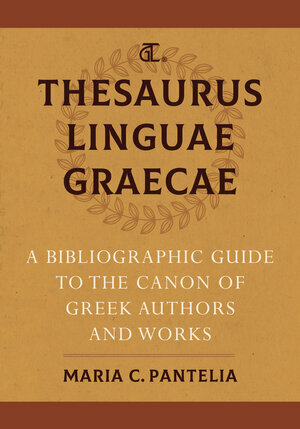 A printed version of the Canon was last published in 1990 (Luci Berkowitz and Karl A. Squitier, Thesaurus Linguae Graecae Canon of Greek Authors and Works, 3rd edition, Oxford University Press). The Online Canon, now edited by Maria Pantelia, has grown substantially since the early 1990s, especially as the TLG® expanded into the Byzantine period. The Online Canon database currently contains over 12,000 bibliographical records and is regularly updated to include new entries as they are added to the TLG® Digital Library. For information or suggestions, please contact Maria Pantelia. Read more about the TLG® and its history.